MALABO, Equatorial Guinea, Dec. 20, 2012 /PRNewswire-USNewswire/ — Teodoro Nguema Obiang Mangue, Second Vice President of Equatorial Guinea, Head of Defense and State Security, has expanded the national zinc sheet distribution to the island of Annobon. The zinc roof campaign has broadly covered the continental areas of the country and the island of Bioko, and is now in its third phase with the expansion into the remote island of Annobon. Thousands of zinc sheets have been donated and other services provided to improve health, education and sanitation. The Second Vice President has spearheaded the campaign and the implementation of the various social projects that have accompanied it. The public-private initiative is carried out with support from international oil companies and is part of the government’s efforts to improve living conditionsand generally raise the standard of living, especially in rural areas. MALABO, Equatorial Guinea, May 19, 2011 /PRNewswire-USNewswire/ — The government of Equatorial Guinea has launched a project to replace improve traditional housing by installing zinc roofs on more than 30,000 houses. Roughly 100,000 Equatorial Guineans will benefit from zinc roofs, which will replace traditional roofs made of the fronds of the nipa palm. This project for Equatorial Guinea compliments MAECI Roofing Project that was launched in 2010. MAECI constructed a sheet metal roofing facility in the city of Bata. This plant is an additional source of roofing materials for the country. The project, which arose as a result of a survey carried out by the Ministry of Agriculture and Forestry, under Minister Teodoro Nguema Obiang, is aimed at upgrading homes in rural areas and will be carried out throughout the national territory. Zinc roofs last longer than nipa roofs and allow better protection from the elements. Nipa roofs also can harbor rats, insects, and other vermin and can pose a health hazard to residents, particularly children. “This is an important project that will quickly improve the standard of living in rural areas,” said Minister Nguema. “Through efforts like these, Equatorial Guinea is rapidly developing its infrastructure. Improving health and opportunity in rural areas is a top priority for the Ministry of Agriculture. We hope this will serve as an example for other countries to follow. The Oveng farm is maintained by 25 – 30 members of the surrounding villages. 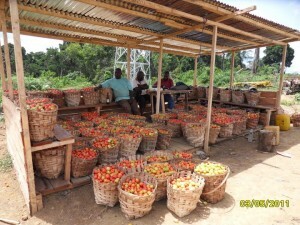 Once the tomatoes and eggplant are picked and bagged or boxed, they are delivered to the local market. 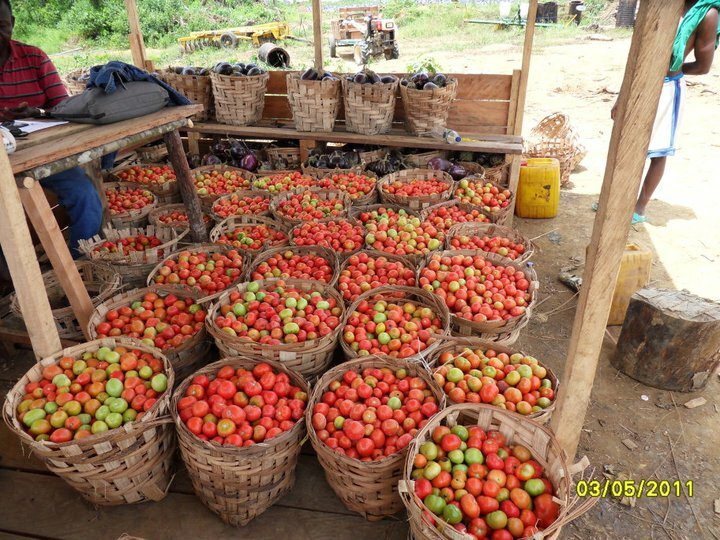 According to MAECI Vice President Christopher J. Massaro, The farm is expected to produce 15-20 tons of tomato and eggplant per year, which will satisfy the current demand within the country, and eliminate imports from surrounding regions. This project is a part of the Green Revolution that has been supported and invested in by the Government of Equatorial Guinea and the President Obiang Nguema Mbasogo and Minister of State, Minister of Agriculture and Forests H.E. Teodoro NGUEMA OBIANG MANGUE.